It was a classic rope-a-dope. Last year in the UK, Xbox picked itself off the floor for what would be one of the fiercest fights between PS4 and Xbox One that we'd witnessed since they launched. The release of Xbox One S, Gears of War 4 and Forza Horizon 3 gave the Microsoft company some renewed confidence (we know, because they told us). And during September, October and parts of November, Xbox One was enjoying a sustained period as the UK's No.1 games console for the first time. That was until PlayStation pulled itself off the ropes and struck back. "PS4 remains Britain's best-selling console for another year," boasts Warwick Light, speaking to GamesIndustry.biz for his first interview as the head of PlayStation UK. "We comfortably won the Black Friday period, and the Christmas Peak and January. So we're delighted with our sales. But it has been a fiercely competitive market." "We comfortably won the Black Friday period, and the Christmas Peak and January. So we're delighted with our sales. But it has been a fiercely competitive market"
Not everyone emerged from 2017 as relieved and happy as the PlayStation UK team. It was a confusing year, where huge successes like FIFA 17, Uncharted 4, The Division and Pokémon were offset by disappointing performances for Call of Duty: Infinite Warfare, Titanfall 2, Dishonored 2 and Deus Ex. "It has been tough for some and great for others," Light acknowledges. "If you look at just what has happened in the hardware space, there's been Xbox One S, our new slim, PS4 Pro, VR headsets, a bunch of peripherals for those... it's been highly competitive before you've even thrown software into the mix. So it's not surprising that it's been a bit topsy turvy." 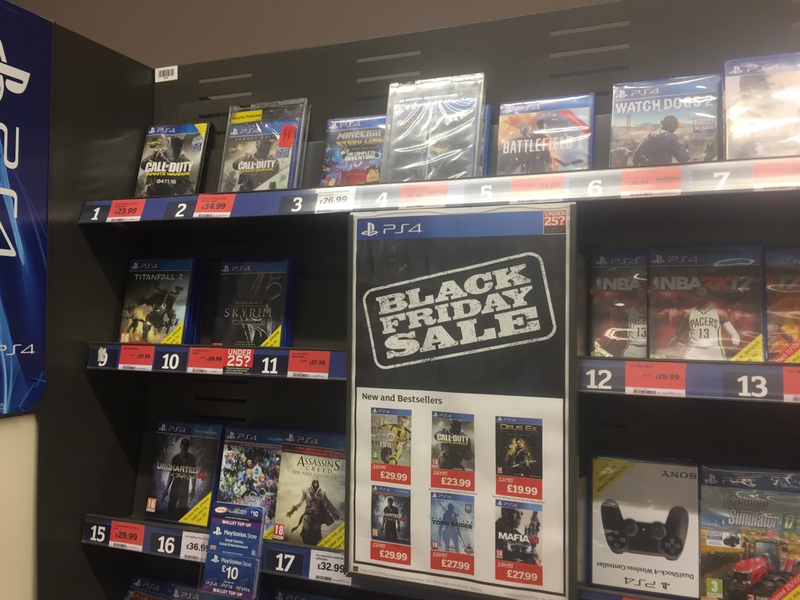 The moment PS4 battled back can be traced to Black Friday - a US sales import many in the UK publishing community could do without. Last year's event was notable not for the quantity of games that were discounted, but for the titles chosen. Products that had only been on shelves a few days - Dishonored 2, Call of Duty: Infinite Warfare, Watch Dogs 2 - were dramatically reduced in price. At one retailer, Titanfall 2 had its RRP slashed by more than 50% just a month after it came out. Surely this could have a significant impact on consumer pricing perception? "Black Friday is in different phases around the world," Light explains. "In the UK, it is a lot more mature and it is getting to be a bit of an institution. Because of that maturity, you are starting to get that natural dip just before you go into Black Friday, then you get that enormous peak of Black Friday that carries on into Cyber Monday, and then it dips again. What we saw last year is that console hardware had pretty good momentum during the whole Christmas peak period. "The last Black Friday was really the first time where we have notably seen software playing a real role. I think some of those software releases that you're talking about followed a similar pattern to what we've seen on console in the past - a noticeable dip before Black Friday and then seemed to rally through the weekend and came out quite favourably through peak. This phenomenon is definitely something for publishers to try and get their heads around. The good news from a hardware and software point-of-view was just how prominent gaming was within the media during Black Friday. Anecdotally, we heard from retailers that PS4 was the most searched item for Black Friday across all categories. That was good news for us." Warwick Light is a PlayStation veteran. Beginning his career in the company's New Zealand office, he ended up leading the Nordics, Iceland, Eastern and South Eastern Europe - a business segment known as 'NICE and ESEE'. "That include Russia," says Light. "So it was anything but nice and easy." Those markets combined were roughly the same size of the UK business, so when former UK boss Fergal Gara moved to Amazon, Light was the ideal pick to take on the challenge. And he's finding it a very different beast to the territories he's managed in the past. "The profile of gaming in the UK, versus some of those other countries, is huge," he observes. "There are people here with OBEs with services to gaming. For some people it's a platform, to others it's a lifestyle, to some it's a place to work, it gets government support, it has its own economy in many ways. The sheer size of it is pretty big, probably the second biggest outside of the US. But it's full-on and very competitive, and great fun." He has only been here for 18 months, but Light has already seen his remit expand to both Australia and New Zealand as part of the global restructure of PlayStation last year. Managing two sets of PlayStation businesses on either sides of the globe seems... ambitious. "There are quite a few similarities between Australia and the UK," Light posits. "Both in terms of the competitive nature of the two regions, and also the retailer landscape is reasonably similar. There are good benefits to be had with some closer collaboration between us and them." Yet if running two fiercely competitive markets wasn't difficult enough, Light has another challenge on his hands and one that his peers in other parts of the PlayStation business are currently facing. For all its success, fewer PlayStation 4s were sold in the UK last year than the year before - it was marginal, but there was a drop. Globally, 17.5m PS4s were sold in 2016 versus 17.4m in 2015. Both stats suggest that we are at that point in the console cycle where sales have peaked - just as we have seen on every previous generation. It's not a challenge exclusive to Sony, but with the suggestion that this current console cycle might be a long one (or, indeed, the last one) there is pressure to sustain a high level of sales for as long as possible. "There's always been, historically, a natural bell curve occurring," Light says. "I guess there are three ways we are trying to address that. The first is PS4 Pro, the second is VR and the third, I guess, is great games." He continues: "Pro was a gutsy move by SIE. It's iterating on a console mid-lifecycle with a view to giving players a heightened, or enhanced, PlayStation 4 experience. It's no secret that it is following a mobile phone market model, which worked well there, but it is still risky. It takes a lot of investment to pull that off. I would say we are pretty pleased with the way that has gone, but it is early days. We need the enhancements in the console and the content to gain traction, we need supply to improve and then we can start widening the message out on that to a broader audience. "The other thing is innovation, and VR is a remarkable piece of innovation. It is great to get that out of the science labs and into people's homes in a meaningful way. VR is in its infancy as a technology, but it is nice to be here at the start. VR has huge potential. That should help us address that lifecycle. It is plausible in the future that the console becomes the peripheral for VR, rather than the other way around. "And then finally it's about great games. Horizon: Zero Dawn coming out, GT Sport with a VR mode and then the new Uncharted content. There's a whole raft of titles that we are looking forward to in the future." "40% of PS4 Pro purchasers in the UK were people we've not seen on the PlayStation 4 platform before. That's very interesting"
One of the stats that Light was keen to roll out was that 40% of PS4 Pro purchasers in the UK were new customers. 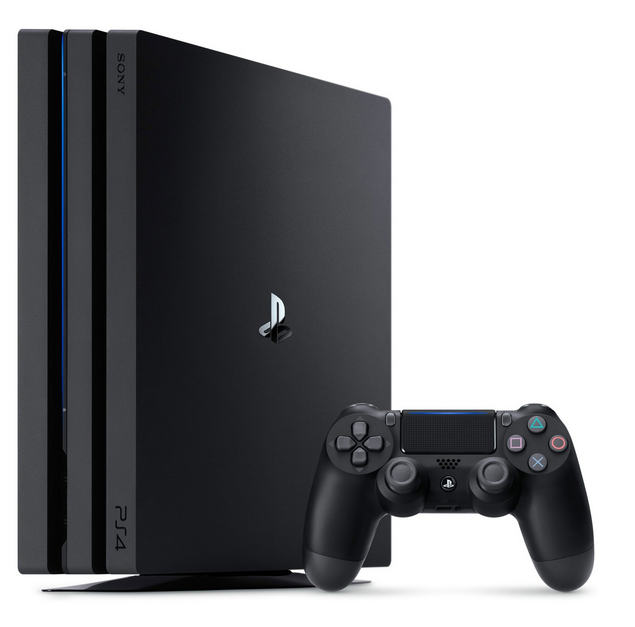 Clearly the firm had expected the vast majority of buyers to be existing PS4 owners looking to upgrade, but that hasn't been entirely the case. 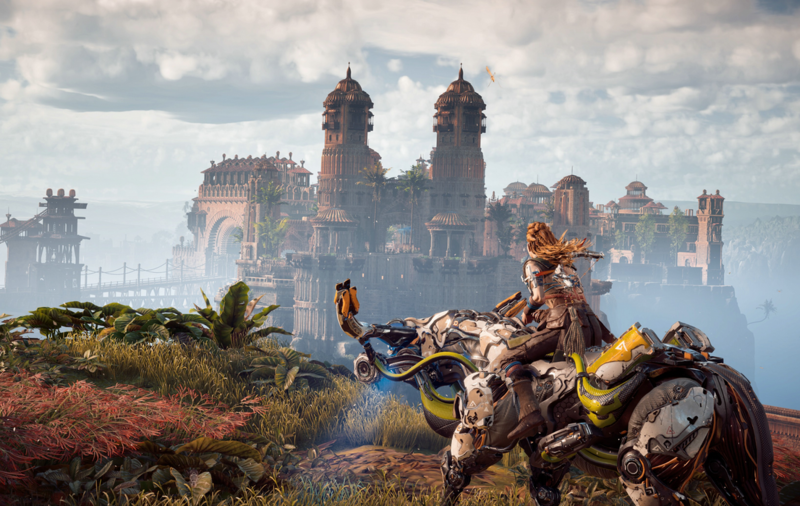 Light describes the launch of Pro as "measured", but armed with this statistic, he plans to significantly ramp up the promotion around the machine as more stock comes into the market (plus Horizon: Zero Dawn - a game that makes good use of Pro's extra abilities - will help when that arrives on March 1st). It's a similar story with PlayStation VR. Sony took a rather soft approach with the arrival of its headset late last year, but Light is keen to stress that this isn't a lack of commitment of PlayStation's behalf. And commitment is needed at this stage in the VR story. Last year, the former boss of PlayStation's London Studio Dave Ranyard predicted that there would be an anti-climax around VR at the beginning of 2017, and there has been signs of concerned investors who are starting to realise that VR might take a while to develop. "Dave is referring to the hype cycle that you see whenever you have a new technology product," Light adds. "We had a fairly measured launch. We kind of knew that demand would outstrip supply, so we had to be careful ourselves not to over-hype the product. That was quite tricky to do, because at the same time we also had a responsibility to let the mass market know that there was a viable and affordable VR new entrant. So we had to be clever in the ways that we did that. So rather than going out big with a huge TV campaign, we sort of went underground a little bit. 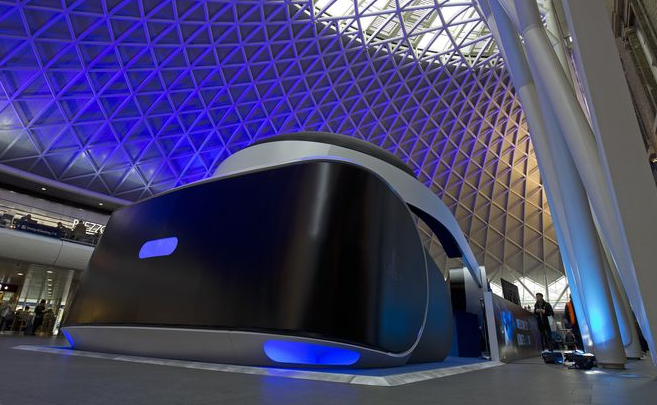 One of the more clever things that I think we did was the installation of a giant PlayStation VR headset at Kings Cross Station. That gained a lot of media attention. It was great to see it on BBC Breakfast, highlighting the fact that there was this new VR headset. "As we address the supply issue, we will be able to go out with a lot more mainstream messaging on VR. "And the other thing is content. Content is king. There is some incredible experiences out there. My personal favourite is Until Dawn: Rush of Blood.Then we've had Resident Evil 7, which has just released. And there's more great content to come, like GT Sport and Star Trek. There is this fascination for all of us to live the life of our childhood heroes. Whether that's becoming the Batman, or being on the Bridge in Star Trek, or in an X-Wing fighter in Star Wars... that sort of stuff has to have traction with players. "As we address the supply issue, we will be able to go out with a lot more mainstream messaging on PlayStation VR"
"It's not just the games but other experiences. There's a lot of cool content on YouTube's 360-degree video channel. Just earlier this week I watched the highlights of Australian Open. I watched Nadal and Federer slugging it out in a VR experience from the back of the court. I was almost standing right behind Nadal as he was playing." "Anyone that puts on a VR headset... their minds start racing on what the possibilities are for this technology. As those experiences start to come online, it will create a stickiness for PlayStation VR." Light highlights PS4 Pro, PSVR and some of the upcoming games, but all of these products are currently aimed at gaming enthusiasts. Sony has remained steadfast in its 'for the players' mantra, but we're approaching that point in the cycle where - historically - kids, families and new audiences might start to take an interest in the console. Yet Sony has a challenge on its hand here, because although PS2 and Wii did a great job of attracting those audiences, the kids and family market has since been scattered across PC, console, tablets, smartphones and even non-gaming services like Netflix. "If you look historically, there are a few natural tendencies that have often helped at this stage in the lifecycle," Light says. "About at this point, you really start reaching a pretty broad audience. And with 53m+ PlayStation 4s actually sold through and in people's homes, you start to get that friend-get-friend phenomenon. That's where people come round, have an amazing experience at your place, and then start asking themselves why they haven't got one at home. I think we celebrated that quite nicely with the PlayStation 2 'Get On Board' TV ad, where people rushed to create this PlayStation mountain. And that's starting to happen now on PS4. "Price and value also starts to come into play at this point in the lifecycle. There are some amazing value deals out there, with a range of content for all players. I also think the development community will start to play a role in that broadening. You'll see them looking at games for all ages, as well as different types of games that perhaps we haven't seen before. We had a lot of success last year with Ratchet & Clank, which obviously appeals to a younger demographic. Also, we are really looking forward to welcoming our old friend, Mr Crash Bandicoot, back to the platform. Things like that will all contribute to broadening out." The start of 2017 looks relatively quiet for Sony. Horizon: Zero Dawn, Light promises, will receive a big marketing initiative - "We're really backing it," he says. And he has high hopes for GT Sport, which will be the first time that the most successful PlayStation franchise of all will arrive on PS4. "We've got fantastic momentum. Nintendo is back in the market. Scorpio could be interesting. What we are seeing is a great deal of attention in the category, and that has got to be good for all of us"
Beyond that, however, it's a bit of a mystery. Sony has shown new games likes Days Gone, God of War, Death Stranding, Spider-man, Dreams, Knack 2, The Last of Us II, Final Fantasy 7, Shenmue 3, Detroit... but when these projects will actually ship is anyone's guess. Yet Light doesn't seem concerned. PS4 has achieved its current standing in the console sector without a huge number of major exclusives. There's no rush to get those titles out to market. In fact, looking broadly at the new hardware coming to shelves and the return of big brands like Red Dead Redemption 2 and Destiny 2, Light is bullish over the potential that 2017 holds. "It is going to be another big year for gaming," he concludes. "As I said, we've got fantastic momentum. Nintendo is back in the market. Xbox... who knows what they're up to? Scorpio could be interesting. What we are seeing is a great deal of attention in the category, and that has got to be good for all of us."